Well football fanatics, it’s that time of year again where you get to start fresh and pick your fantasy football team. Is there’s a better feeling than the anticipation of what lies ahead for the football season? I don’t think so! If you’ve been keeping up to date on all the latest draft kits, injuries, stats and cheat sheets, then you are at a good starting point. Plenty of research and keeping up to date on the latest condition of the players can help you to make better choices and up the odds of you coming out a winner this season! Are you the league’s organizer or commissioner? You will have plenty to do draft day, so be prepared and get your draft strategy together way ahead of time. You’ll want to build as strong a team as possible. 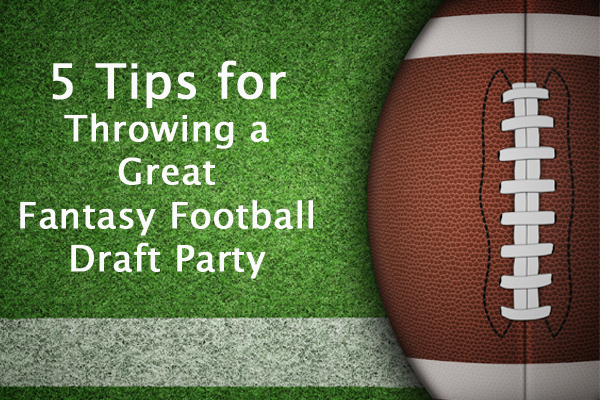 Here are also some great strategies to making sure your football fantasy draft party runs as smooth as possible. This season, the games run from September 8, 2016 to January 1, 2017. For your league to score for the entire NFL season schedule, your draft must be complete by 11:59 pm PT on September 7, 2016. There are many scoring systems, so you’ll want to set your rules well in advance so that the owners can base their draft picks on the scoring method you’ve chosen. The serpentine (or snake draft) is the most popular draft system. The order of the draft reverses with each round. Owners should also be informed about trade policies, all fees and prizes, the website specifics and the protocol for settling any disputes. You may want to make up a short rule book in advance and distribute copies to owners on draft day. As the draft host, it’s your responsibility to plan the party – whether you host it at your home or meet at a bar or restaurant is up to you. The draft is sure to last several hours, so consider serving some food, it could be simple such as pizza, chips and wings or more elaborate. A tailgate theme might be appropriate, considering that it is in essence the beginning of the football season. Or you could have all the owners meet at a favorite restaurant when the draft is over to enjoy fine food and brag about their teams. By all means, have a well-stocked refrigerator full of everyone’s favorite beer! The most important item to have ready for draft day is the draft board. It could be a simple piece of poster board with room enough to make a 6-inch column for each team. At the top, write the team name. The rows below will represent the draft rounds. Make up color-coded (by position) deck of cards with the names of the eligible NFL players. Be sure to keep the board up to date as the draft proceeds, making sure to keep track of all trades. Or, you could use an erasable white board and write in the players’ names. Pre-assembled boards are also available on the Internet with a set of player cards. Another possibility is to use a computer with an Excel spreadsheet to list the choices. Consider using a stopwatch or kitchen timer to keep the draft moving. Many organizers give owners 90 seconds or 2 minutes for each pick. Others allow longer, say, 5 minutes, for the early picks and only 1 minute during later, less critical rounds.